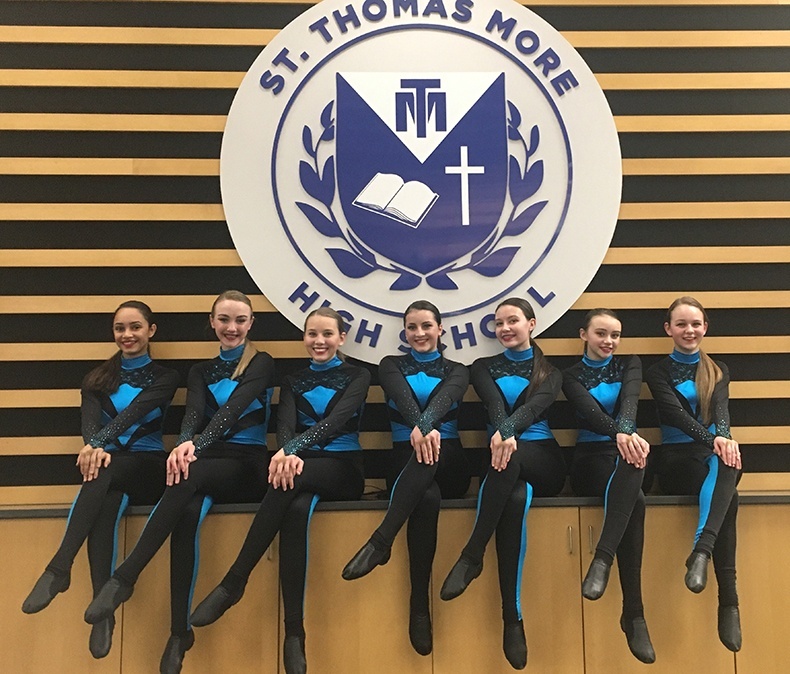 St. Thomas More Dance Team might not be the biggest team, but what they lack in size they make up for in determination. 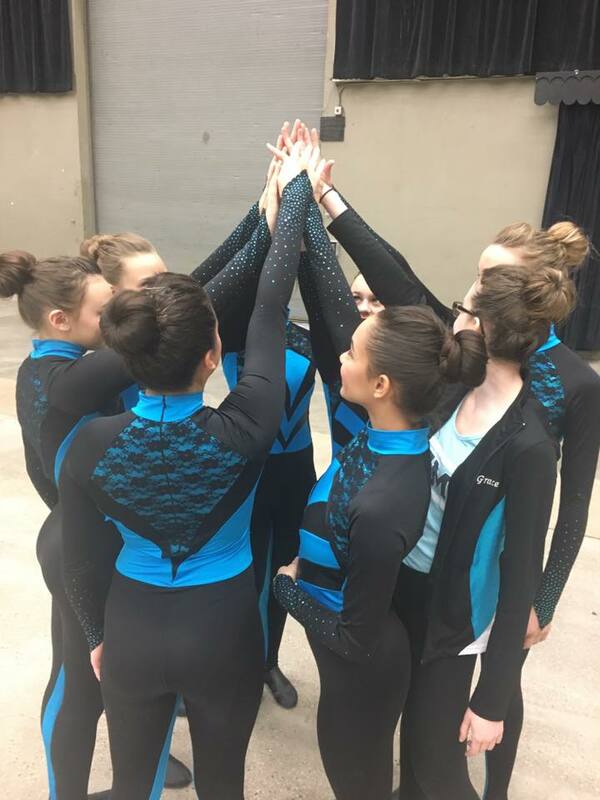 We talked to Coach Nicole Letko and her dance team about the motivation for their high kick routine this year. 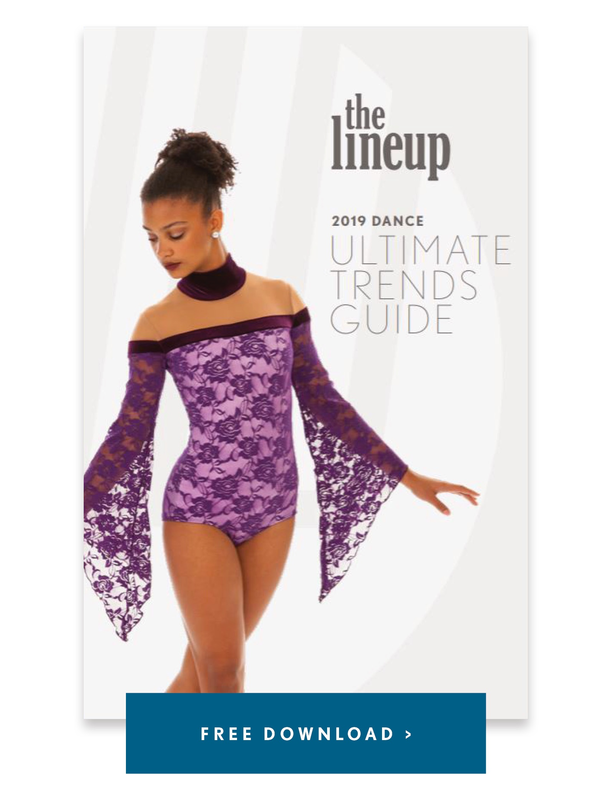 “We wanted to create a kick uniform that illustrated intensity and fierceness,” she said. Even though the team is only 7 dancers, they knew their energy and intensity had to match that of any other team they were competing against! 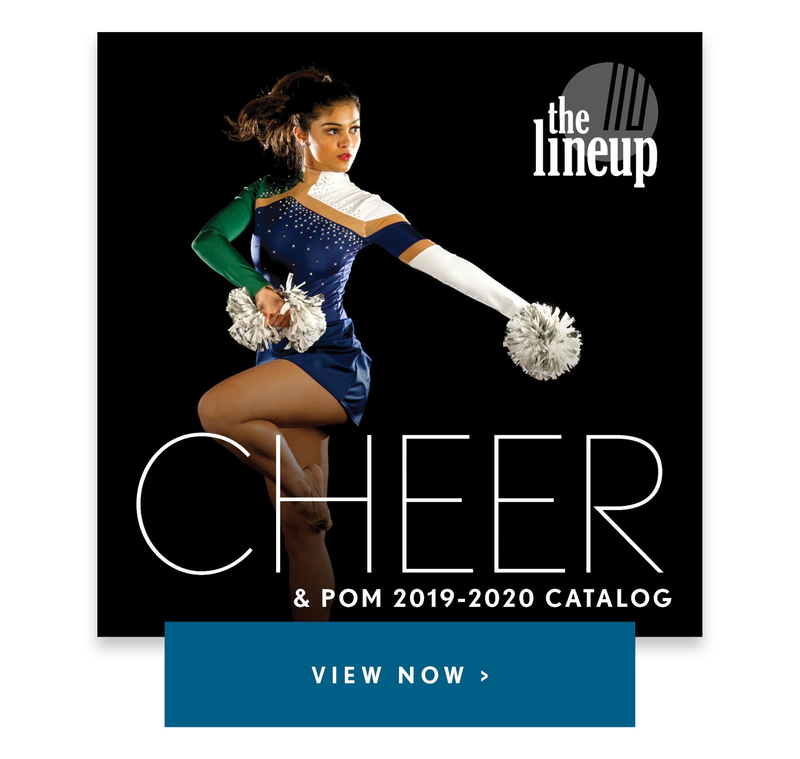 Their custom kick uniform combined two dynamic elements to help them stand out: a bold color scheme and strong lines. While they only used two colors, the contrast of light blue against black created a crisp look that helped accentuate a color change. A stripe of turquoise lining the inside of the leg highlighted their kicks. Adding spangles to the sleeves of the uniform was another nice touch that added a little sparkle to stand out against the dark sleeves, and the dramatic blue V insets on the bodice added a sharp edge. Overall it was a look that achieved their fierce goals! Check out more Q & A with Coach Letko below! Our Division 2 Kick routine was performed to Katy Perry "Rise"
Our team is unique because despite our small team size and the fact that we have girls from all different dance skills and backgrounds, we do all that we can, working hard 10 months a year in a small dance room, pushing one another to become confident dancers. 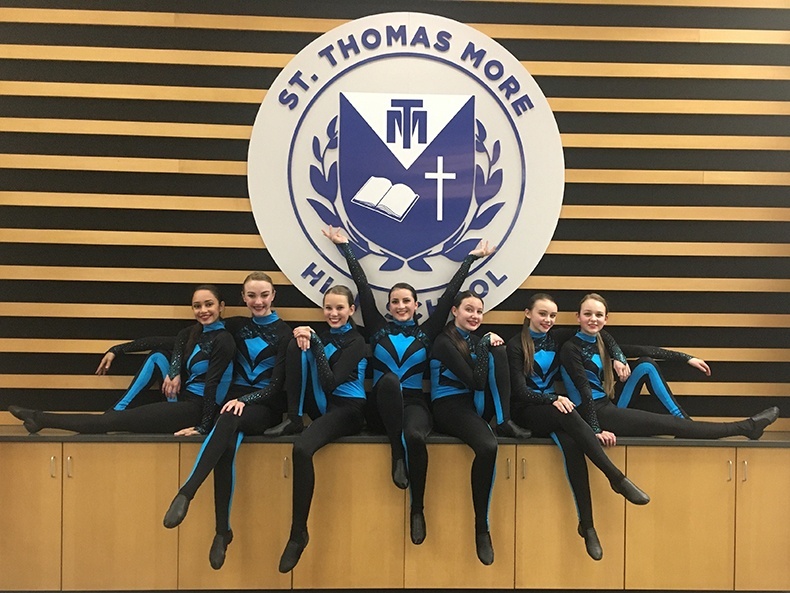 St. Thomas More dancer, Grace Rogan weighed in to answer this question: "My favorite memory was seeing the happiness on my teammates' and coach's faces when we heard our name being called for second place in the Pom Division at WACPC Regional's! Just seeing the joy and shock emanate from my teammates' faces made me feel so good. All our hard work and dedication during the season, and overcoming all the obstacles we faced, had paid off. It felt so good to work so hard and make it together." We faced many challenges this season. We lost a few members to our team and struggled with injuries which meant that we had to constantly change routines. Although it was difficult, we pushed through and prevailed. We put out great routines that showed our style as a team and we were proud of them. Regardless of the many challenging experiences this season, we came out stronger and with a completely different sense of determination!